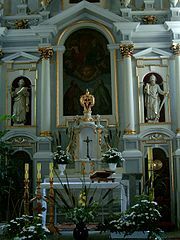 Having said “Amen” after the server’s response to the “Orate fratres,” the priest, standing at the centre of the altar, reads from the missal, placed at his left (Gospel side), the prayers called “Secretæ,” which always correspond in number with the collects read at the beginning of Mass. As to how the term secret came to be applied to these prayers much diversity of opinion exists. According to some, this name was given them because they were the first prayers recited after the catechumens had been dismissed or set apart (secreti) from the rest of the congregation, the Latin origin of the word—viz., secernere—favoring this interpretation. Others say they are so called from the fact that they are recited over that part of the offerings presented by the people, according to the ancient rite, which was separated and set aside from the rest for altar purposes. The great weight of authority, however, inclines towards attributing their name to the fact that they were recited secretly—that is, in a sort of whisper—in order not to disturb the singers, who in ancient times were stationed in the choir quite close to the altar. In order to have as little difference as possible between one kind of Mass and another, the Church has allowed many things to remain in Low Mass which really had their origin in High Mass, and, as we have taken care to state already, the majority of Masses in the early days were of the latter kind (Romsee, p. 162; Enchiridion Sac. Missæ, ex Opere Bened. XIV., p. 55). At the end of the last secret prayer the Offertory is said, strictly speaking, to conclude.